In a world where closed-loop liquid cooling systems have become a default choice for enthusiast-class PCs, the evolution of air coolers has inevitably slowed down. Nonetheless, there are manufacturers that keep introducing rather interesting air coolers that can cool down even high-end desktop processors. 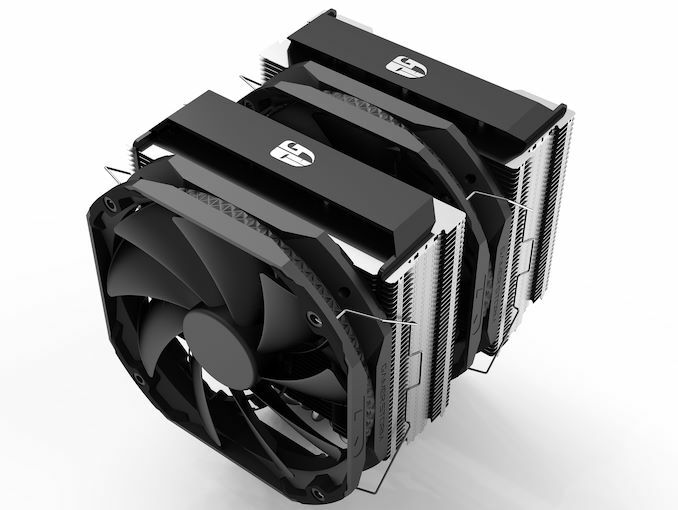 One of such devices is Deepcool’s Assassin III, which was demonstrated at this year's CES. The 165-mm tall Deepcool Assassin III is comprised of a massive aluminum radiator equipped with seven heat pipes and two 140-mm fans. According to the comapny, to optimize airflows and maximize performance the cooling system actually features spoilers on its top fins, a rather unusual engineering decision. The Assassin III is rated for up to 280 W of cooling, which is enough for any high-end workstation CPU at stock speeds, and also enough for most overclocked desktop processors. Besides its cooling performance, Deepcool's other key design choice with the Assassin III is its compatibility with high-end RAM modules. The high profile design of the cooler means that it can stay clear of DIMMs of up to 54 mm in height, up from 45 mm in case of the previous-gen model. At this point Deepcool hasn't nailed down all of the specifications of the cooler, as won't hit the market until a bit later on. But expect the device to weigh around 1.5 kilograms, while the cooler's acoustics should be favorably limited thanks to the two 140-mm fans. And of course, it will be compatible with all modern CPU platforms from AMD and Intel (though compatibility with TR4 is something that remains to be seen). Deepcool intends to start selling its Assassin III mega cooler this May at an MSRP of $99.99. Traditionally for Deepcool, the device will be bundled with a screw driver and G-15 thermal compound. This product is not meant for me either and I’m an overclocker. For $100 I can get a decent closed loop water cool AIO. By the way, I was just looking at some water cooling AIO on Newegg. I saw an EVGA for $8.44. What!!! It's sort of like the most souped up 1.5l engine you can find. That's great if you're competing exclusively in the "1.5l or under" category. For a little more money (and if you are willing to invest $100 in the cooler you may be willing to pay slightly more) you can get proper liquid cooling. Liquid cooling typically does not outperform high-end air cooling.